Parco San Grato is a great way to escape the city heat. As soon as you enter these one-of-a-kind botanical gardens you’ll feel you're in an enchanted world where colours and scents make for a truly unforgettable experience. 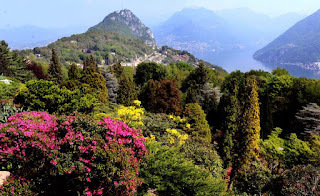 With a surface area of 62,000 m², Parco San Grato boasts the largest collection of azaleas, rhododendrons and conifers, in terms of variety and quantity, in the whole Insubria region. Located between San Salvatore and Monte Arbòstora, approximately 10 km from Lugano, it extends up to 690 metres above sea level, and offers outstanding views over the nearby area. While visiting the park you find yourself immersed in an environment with one-of-a-kind natural and decorative characteristics: the large swathes of azaleas and rhododendrons are crisscrossed by five thematic trails: botanical, relaxation, scenic, artistic and fairy-tale, each one of which reveals different aspects of the park which are renewed as the seasons change. The playground is easily reachable and located in the center of the park, amongst rare, impressive conifers. It offers children and adults the chance to play and have fun. San Grato Restaurant, with its scenic terrace, is organised so as to meet the needs of everyone, from Sunday day-trippers to refined gourmets. The park also features a chapel dedicated to Saint Grato, the Saint invoked against lightning, storms, pests harming crops and to pray for rain during periods of drought. Get your kids involved and ready to go. Prepare for a true Ticinese adventure! Click here for a detailed brochure: Parco San Grato.